Ever wanted to quit your day job and take to the skies? Talk to Ron Webster. Since he started soaring - that is, flying without an engine - in the late '70s, the guy has logged 2454 hours of airtime. That's the rough equivalent, he says, of a year's 9-to-5 labor. This lucky duck spent all of it gallivanting over the Green Mountains at altitudes of up to 7000 feet. Nice work if you can get it. Webster, now 70, is the vice president of the Sugarbush Soaring Association, which is headquartered at the Warren-Sugarbush airport. The skinny stretch of tarmac sits in a stunning nook of the Mad River Valley next to a restaurant aptly titled Diner Soar. Most days, Webster and the rest of his sun-bronzed crew fly gliders to destinations as far off as Mount Washing-ton in New Hampshire. First the "ships" are towed up to about 3000 feet by an old crop-duster plane. After that, any power they harness is au naturel. The Warren-Sugarbush airport is one of only four in the state to offer soaring, according to airport personnel. The pastime's not cheap: It costs $112 for a 20-minute ride in these skies. While earning a gliding license depends on individual skill levels, an average package of pilot certification lessons runs $4000 to $5000. So what keeps this operation afloat? On a recent sunny afternoon, I went for a soar with Webster to find out. Along the way, I picked up a layman's understanding of how the sport works, not to mention a sense of why so many glider pilots devote their waking hours to imitating winged mammals. When I arrive at the airport office, Rob Webster is lounging on a bench with his teenage grandson Sean, an aspiring pilot. The former's face is tanned and creased like a well-oiled riding saddle, and a pair of huge black sunglasses obscures his eyes like pirate patches. An east-facing window at Webster's back offers a mountain panorama. The view is too enticing, apparently: After a few minutes of small talk, Webster cuts off conversation and leads me toward the runway. A hundred yards away, his colleagues Bob Messner and Rick Hanson have been prepping for our flight. Messner is wearing silver-rimmed aviators, a hat, short shorts and high socks. He could be an expat on a South Pacific island. In contrast, Hanson's manicured appearance is more Connecticut yacht club. Turns out the nautical imagery is perfectly suited to this enterprise. The glider has two razor-thin, curvaceous wings; its body could almost be mistaken for a racing sailboat. That's no coincidence, according to Messner. "There are a lot of analogies to sailing," he explains. In both cases, "You have to analyze the weather and make it work for you." Make weather work for you? On first hearing, such a brash assertion sounds like something George W. Bush - who owns a macho-riffic fishing boat - would say about global warming. But in fact, gliding requires an astounding degree of humility and patience. In order to make the weather "work," pilots must channel and respond to three basic atmospheric phenomena: "thermals," "ridge lift" and "mountain waves." To elaborate on the logistics of the sport, the men point up at one of their protégés - 15-year-old Quincy McDougal, a newly minted pilot, who happens to be circling under a cloud right above our heads. With no engine, you'd expect him to be cruising downward. But the longer we stare, the smaller his craft looks. That's because he's climbing at up to 600 feet per minute, courtesy of a "thermal." Unlike the standard plane, which leaves a linear contrail, McDougal's has a spiraling flight pattern resembling a hawk's. That makes sense, according to Hanson, since gliders are much closer to "pure flight" than are petroleum-powered crafts. In fact, these men report crossing paths with birds at high altitudes. "Here's this thing with a 54-foot wingspan, and [the birds] don't fly away from you!" Hanson says. At first glance, with only one landing wheel and a cockpit that's a mere foot off the ground, a glider strikes me as an aerodynamic death wish. But, notes Webster, gliding is actually safer than traditional flying. That's because fossil-fuel-friendly ships can't coast as far in the event of engine failure. 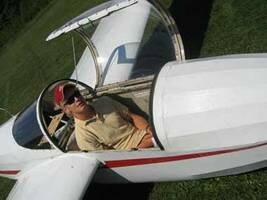 "If I can get to the bottom of those clouds," he explains, pointing a mile into the sky at McDougal's plane, "I could glide to Morrisville airport" - a journey of more than 30 miles. "But if I were [broken down] in my Cessna [airplane], I couldn't go 7 miles to Waitsfield." "Good to know," I say, battling the butterflies in my stomach. As with most children of the post-industrial era, my aerial navigation skill is limited to asking the flight attendant for extra peanuts. Despite my inexperience, Webster puts me in the glider's front pilot's seat, which sits directly in front of his. I've never been particularly afraid of flying, but this cockpit feels claustrophobic, and, when the glass canopy closes, the air inside is unbearably stuffy. Just before takeoff, Hanson hands me a vomit bag and winks. "Just in case," he says. Messner approaches, hooks us up to a precariously thin, yellow tow rope and hops into the crop duster. Then he powers up his prop and launches down the runway. There's a short delay as the tow rope slithers along behind him. Then the glider jolts forward and we're rocketing. Though it trails behind the crop duster, our craft lifts off the ground first, as if it were a parasail. "He has to catch up to us!" Webster yells over the roar. The plane takes off. A minute later, we're dangling by a thin cord at 3000 feet. "Do you see that yellow lever I told you not to touch?" Webster asks coyly, pointing at my console. "I want you to pull it." After a flicker of hesitation, I yank, and the sound of the crop duster's engine fades away - whoooosssh. It's as if we'd been watching an IMAX movie and the surround-sound cut out. Fortunately, Webster also has pilot's controls in his seat, so we don't plummet to a tragic end. On the contrary, over the next 15 minutes he milks the thermals for a 2000-foot altitude gain. In the process, my fear morphs into sublime reverence. At this height, I'm watching clouds form, wisp by wisp - an alchemy that would elude description by the best poets, or climatologists. "Ever feel like you're ascending up to heaven, Ron?" I ask. "No," he replies dryly. "But this is paradise!" The clouds are excellent metaphorical templates, to be sure. According to Webster, however, they're also functional. As we circle higher and higher, the gliding guru explains that each puff is a "gas station" of potential energy. With that, he points the nose down, and we cruise through blue sky at more than 100 miles per hour. "Here's some gas!" he shouts, reaching the next cloud. "Here's some more!" Suddenly, what had seemed like a peaceful visit with Saint Gabriel now resembles a day at Thunder Road Speedbowl. The wind raps furiously at the cockpit glass. Webster rotates the glider around clockwise, calling out notable landmarks: "Mount Abraham . . . Camel's Hump . . . Montpelier . . . Northfield!" More intriguing is the voyeuristic angle on the region that gliding presents. From this height, I see a garbage dump hidden in a copse, a secluded pond, a winding country road. "What's that deforested clearing down there?" I ask as we race by. "That's where someone planned to build a house, then decided not to," Webster answers. Then he brings us in for a gentle landing. When the glider touches solid ground, Messner, Hanson and the young McDougal congregate around us, and we all begin to yak like old-timers at a general store - except the conversation focuses on clouds and weather patterns instead of town gossip. As the men carry on, McDougal, who is blond and rosy-cheeked, chimes in comfortably with his own observations. If soaring offers a magisterial view of the world, it also requires a localized connection to a physical landscape. Pilots, for example, study minute geographic features such as the deforested clearing. That's because each one is a potential source of thermal energy, or glider gas. "We get to pay attention to things like the life cycle of the cloud," Messner asserts. "The average person never thinks about that." Physics aside, gliding encourages goofy encounters. Messner tells me that even the best pilot touches down in a field now and then. "Farmers are all good people, so they don't mind," he says. "You put their kids in the cockpit and take a picture." "When you look at a big field," McDougal adds, "you're always thinking about what you'd do if you were in a plane." Webster and Messner have been living in and around this field for decades. A former engineer who used to pitch tents for long weekends, Webster finally bought a nearby home in the mid-'90s; Messner has been around since the '70s. How has the sport changed over the last 20 years? I wonder out loud. Messner claims that glider clubs used to assemble their own rigs. These days, not so much - gliding attracts a wealthier clientele. "People have enough money now," he reports. "They have too much money, and not enough time." But despite any aerial gentrification, the sport still boasts a healthy, young grassroots following. McDougal, for one, works on the airport's line crew in exchange for flying lessons. The week of July 30, a cadre of teens will be flying here as part of a 5-day soaring camp. Some airport alums never land for good. Case in point: One of Hanson's daughters graduated from the Air Force Academy in 1993. Another's working at Burlington Airport and plans to pursue a career in airport management. Similarly, McDougal says his hobby could very well turn into a career. "It's a complete blast," he gushes. "I've always been into aviation, so [gliding] is a way to progress towards a license in bigger and more exciting things." His braces aside, the young Lincoln resident speaks with uncommon confidence and sophistication. That's reassuring, considering he operates $100,000 gliders at high altitudes. As the day's clouds disappear, McDougal's mentors wax prophetic about the boy's future. Messner points out that soaring education promotes not just technical mastery but a nose for judgment. "People like Quincy will be in the air their whole lives; I can tell," Webster affirms. Indeed, the boy seems perfectly at home with this crew of aging aviators; it's hard to imagine him back in a high school classroom. "You learn a lot from books and things," he asserts, "but you also learn a lot by hearing conversations." Maybe when Webster looks at the teen, he sees a little of himself 30-odd years ago - when the flying bug caught him and wouldn't let go. "I'm sure a person like Quincy is taking in these stories and listening to what's going on," Webster observes in an easy voice, looking out at the ridge. "He isn't ready to go to Morrisville yet . . . but he's listening."